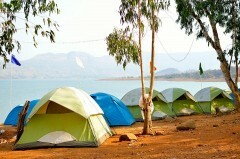 Get away from the city for a camping adventure on the banks of the beautiful Pavna Lake. You'll camp beside the lake, so you can go for a swim and enjoy a session of pedal-boating. When the sun sets and the evening grows chilly, you can gather around a bonfire and enjoy a BBQ and soft music. After a hearty dinner, you'll retire to tents and fall asleep with the sounds of nature outside. NOTE: There is parking space available near the campsite for 2- and 4-wheeler private vehicles. The last 3 kms to the campsite is through an off-road route and is only advisable for high-ground vehicles. 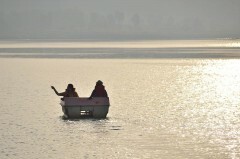 Pavna Lake is near Lonavala, and is perfectly located for a getaway from Mumbai and Pune. During the winter, it can get quite cold here as there is a lot of greenery and rolling slopes all around. In the summer, evenings get cooler, but days are warm. • Camp along the banks of the sparkling Pavna Lake. • Spend a fun day in the outdoors surrounded by lush nature. • Enjoy the lake with a swim and a pedal-boating session. • Bond over a crackling bonfire and music. • Learn how to prepare and cook your own BBQ. • Sleep in tents at night. This is a non-strenuous activity and is suitable for all age groups. However if you have a heart condition or any respiratory problems like asthma, or any form of allergies, kindly check with your doctor before booking this lakeside camping at Pavna Lake. Profanity or misbehaviour will not be tolerated during the lakeside camping at Pavna Lake. Littering around the campsite or near the water body is strictly prohibited. Swimming without a life jacket is strictly not permitted during the lakeside camping at Pavna Lake. The operator will provide life jackets to anyone going in the water. If you cancel the lakeside camping at Pavna Lake 15 days before the check-in date: 75% of the trip cost will be refunded, minus any transaction fees. If you cancel the lakeside camping at Pavna Lake 14-10 days before the check-in date: 50% of the trip cost will be refunded, minus any transaction fees. If you cancel the lakeside camping at Pavna Lake less than 10 days before the check-in date: no refund. The check in time for the lakeside camping at Pavna Lake is at 15:30 hours and check out is at 09:30 hours. There is no transport included in this lakeside camping at Pavna Lake trip and the operator is not responsible for any delays or cancellations. 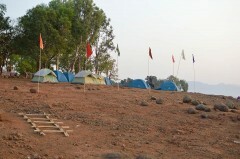 The operator will not be held responsible for any injury, accident or death during the lakeside camping at Pavna Lake. There will be no refund for services unused or missed due to the participants own fault or delay. Washroom and changing facilities are available at the campsite. 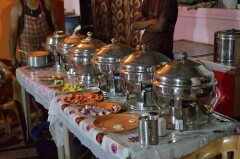 The operator will provide you with the barbeque equipment, but the participants must prepare it on their own. Any damage or loss of the operator’s equipment will have to be borne by the responsible participant. Arrive at the campsite by 15:30 hours. You’ll have tea and snacks before you head for a swim in the cool waters of the lake. You can also try your hand at pedal boating or kayaking and there is plenty of space to play and get muddy. After sundown, a bonfire is lit, the barbeque is set and light music fills the air. Enjoy a fun night out in the midst of nature and you can retire in comfortable tents after. 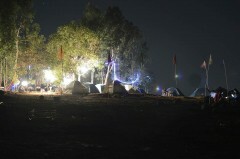 Overnight stay in tents. Wake up early to a gorgeous sunrise and you can dip your feet in the water as you sip on hot tea. You can freshen up and enjoy a delicious breakfast and after this, it’s time to pack up. You’ll check out from the campsite by 09:30 hours and your trip ends here. Personal expenses like extra meals, telephone calls, packaged water, etc. Wake up early and eat a delicious breakfast the campsite. You'll pack up from the campsite and check out by 09:30 hours. Your trip ends here. 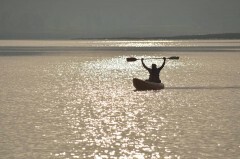 Your campsite is located at the banks of the Pavna Lake, near the quaint village of Chavsar. You can take the local train to Lonavala and then be driven to the campsite at Pavna Lake by a hired cab. You can also drive down to Pavna Lake from Mumbai and Pune and there is parking available for 2 and 4-wheeler vehicles near the campsite.